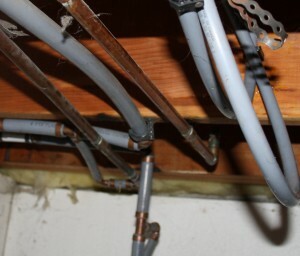 Polybutylene piping, or Poly-B for short, is a flexible plastic supply plumbing material that was in use in home construction between 1978 and 1995. Poly-B can be identified by its light grey colour and the permanent markings on the tubing. As a cheaper and easier-to-use alternative to copper, Poly-B was installed in over 6 million American, and over 700.000 Canadian homes. Over the years there were a number of class action suits, primarily in the Southern United States, against the manufacturer of Poly-B due to claims with its potential to leak. Initially there were issues with plastic fittings and elbows which were prone to crack or break. In Canada we mostly alleviated this problem by using primarily copper and brass fittings and elbows. Plastic fittings, however, can still be found in some homes. Another claim is that Poly-B piping can deteriorate and fail, when exposed to extreme heat, very hot water and where water has high chlorine levels. Chlorine levels in Canada are much lower than those in the United States. Poly-B is permeable to oxygen. Poly-B used in circulating hot water loops is prone to deliver oxidized water which can be very hard on water heaters and boiler and drastically shorten their life. When exposed to sunlight for an extended amount of time, Poly-B piping can break down. Poly-B should not be used nor stored outdoors. It should be noted that the vast majority of Poly-B related issues were reported in the United States. Very few cases have been reported in Canada and most of those seem to be related to poor workmanship rather than the piping itself. While numbers for British Columbia are unknown, Alberta Municipal Affairs is aware of approximately four Poly-B failures in Alberta over the last 20 years, all of which were related to improper installation rather than the materials. I’ve seen copper and PEX fail too, nothing is 100% guaranteed. What can I do to make the best of my poly-B? Most insurance companies in Canada do not consider Poly-B with copper or brass fittings to be an added risk factor. 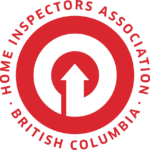 © 2018 FYI Home Inspections. All Rights Reserved.